The restaurant “Under the Rooster” is one of the numerous attractions of the Fairy Tale Hideaway. Here are served delicacies among others specialities of the regional cuisine prepared with the abundance of the surrounding forests; mushrooms, herbs, forest fruit. We meticulously preserve fruits of the nature so that you can take delight in their sublime taste when the aura wears the robes of each season of the year. All dishes are composed with the use of natural ingredients coming from carefully chosen suppliers in order to bring out the poetry of their taste. 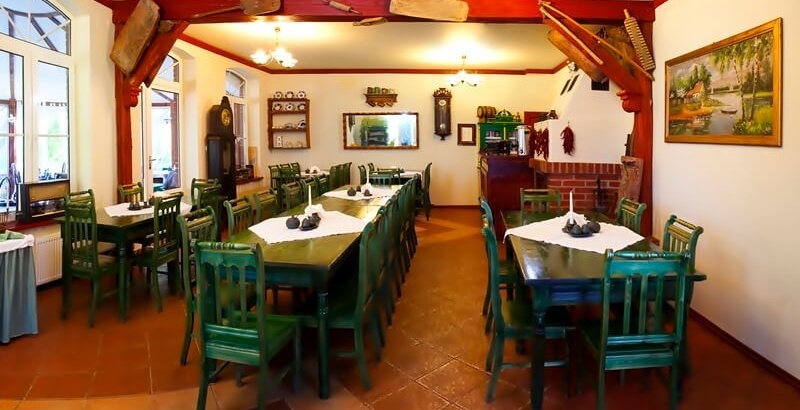 Rumour has it that pierogi and dessert served in our restaurant have no equal in the entire Warmia and Masuria.